Mark on grease proof paper a series of 9 crosses with the measurements of 7cm, 8cm, 10cm, 11cm, 13cm, 15cm, 16cm, 17cm, and 18cm. Gently toast the nuts by swirling around in a large dry pan over heat. Take care not to burn them. Roughly chop the nuts and set aside. Slowly melt the 420g of chocolate over a double boiler, keeping the bowl containing the chocolate out of the water. Once melted add the nuts and stir through. 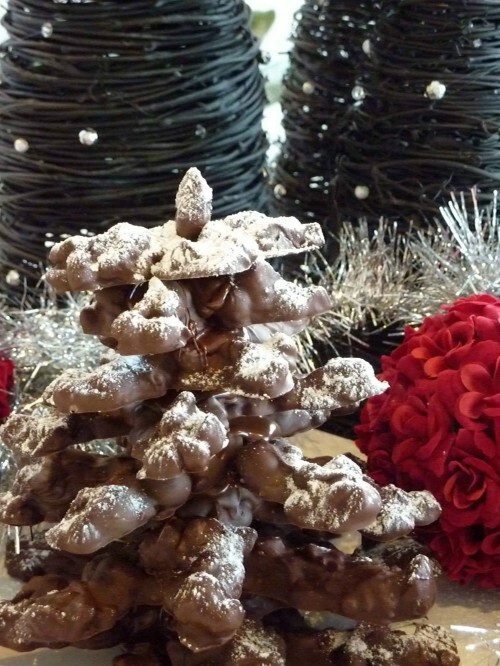 Spread the chocolate mix over the premade crosses to form the branches of the tree. Chill in the fridge. This is necessary in the hot summer heat or the chocolate branches will not be strong enough. Melt the remaining 80g chocolate and carefully peel each branch off the grease proof paper. Stack the branches together, cementing each together with a blob of the remaining melted chocolate. Begin with the largest as the base and work up to the smallest at the top of the tree. Place each cross at a slightly different angle to the previous to create a full looking tree. If the branches droop a little with the warm chocolate added you may need to support them. Crumple up a handy towel or the grease proof paper and prop up the branches if necessary until the chocolate cools again. Cover the last almond in melted chocolate and place on the top of the tree. Dust with icing sugar prior to serving. Serve with coffee or as a dessert. This makes a great centrepiece – where people can break the branches off as they wish. This can be made ahead of time and the chocolate crosses stored until ready to cement together on the day. from Dr Nicky Francis on diet, nutrition, weight loss tips, fabulous recipes and living life to it's fullest!